Three languages are taught to the children, English, French and Igbo. But the most emphasis is placed on English where they are introduced to phonics, fiction and nonfiction books which the school provides to enhance comprehension, word skills and writing activities at their various levels. Poetry and verbal reasoning are also taught where they learn anagrams and coded sequences. Mathematics is taught throughout the 6-year course with illustrations that show clearly how mathematics is part of everyday life. Under this, the pupils are exposed to quantitative reasoning, graphic data, numeracy, number equations, shapes, sizes and logic. Basic, computer, agricultural and health science are taught with the necessary facilities needed to enhance the teaching of these subjects including science equipment and computers where the pupils under strict supervision have access to the internet. Fine art, vocational aptitude, music, social studies, bible knowledge and home economics are taught where the pupils learn their culture and social norms. 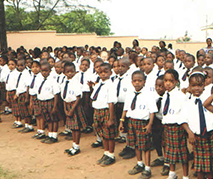 All the material needed for these subjects are provided by the school in addition to excursions and exhibitions which the children are taken to within and outside Nigeria. At both the primary and nursery level, classes are kept to an optimum size to ensure a great deal of individual attention. Every child has the opportunity to reach his or her potential through the caring structured program. Extra support is available to any child requiring special help. A unique diary and file system for individual communication and continuous assessment is maintained.